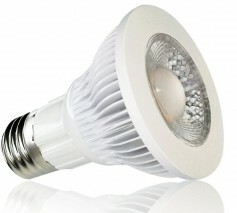 This PAR20 LED bulb uses 1 x 7 Watt COB LED. Great for line voltage track lighting, recessed 4" pot lights (Can Fixtures) and so on. This is our newest dimmable PAR20 LED and our brightest, which replaces our previous models including PAR20-42 LED, PAR20-3x2W and PAR20-3x3W CREE LED bulb. Please contact us for Specifications. Shipped from Vancouver, BC Canada. This LED PAR20 uses 7 Watts to replace an equivalent 50Watt Halogen.